Heat ghee and stir fry rava in it on a very low flame till it just starts changing color. In a separate vessel start heating the sugar-water mixture on medium heat. Once rava chages color to light golden, add scraped coconut and fry for another minute. turn the heat off for the rava nariyal mixture. Increase the heat for the sugar-water mixture and bring it to a boil. Cook without stirring till it reaches a single thread consistency. Add the warm rava-nariyal mixture to the sugar syrup and green cardamom powder and mix well. Keep it covered for a couple of hours. Stir the mixture in every half hour or so. That's it.. then shape the mixture into laddus and decorate with raisins. Happy Diwali! Time to make some rava nariyal laddu! Nice and easy recipe! Am going to make it today :) Happy Diwali !!! 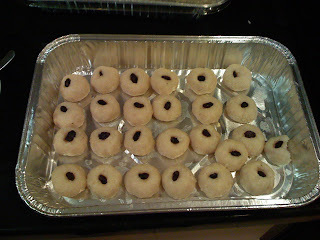 I ate these laddus recently..for diwali prepared by Anuja! great minds think alike.. I missed 'olya naralachi karanjee' this Diwali really really badly.. I agree.. you can't compare it with any ladoo.. Aai will be giving me the recipe soon.. hope to post it here..
hi anuja..these laddus are my favourite ..i tried these laddu with sugar syrup for first time,but it didn't come out well(paak barobar zala nahi:)then I tried using evaporated milk instead of sugar syrup.It came out very well.u can also give it a try if u like.I saw this recepie on Show me the curry. Your blog is very nice..good job . hmmm.. good to know about the alternative method. I guess I have been lucky with the pak so far. Show me the curry is a great resource.. I refer to them quite a bit as well. Thanks for stopping by!